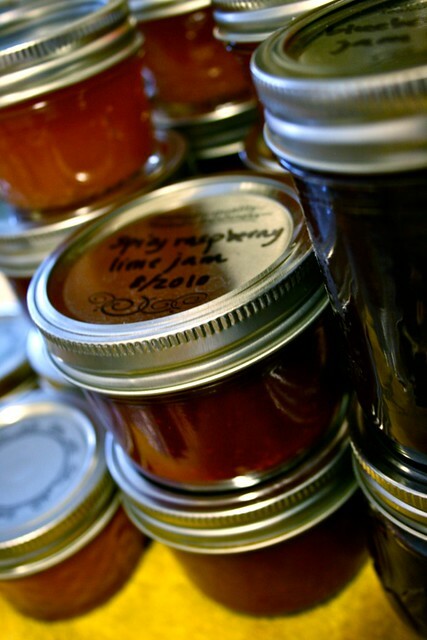 I've been on a jam making kick lately, using honey instead of sugar. My first batch of jam was an absolutely delicious Vanilla Plum Jam using Italian prune plums from Michigan and freshly scraped vanilla bean seeds. It was a beautiful shade of purple, and had a marvelously sweet, aromatic, alluring flavor that tempted me to lick off nearly every spoon, bowl, spatula, and pot it came in contact with. I have a mountain of homegrown raspberries and black raspberries in my freezer, so I naturally gravitated to the idea of making raspberry jam. But instead of your standard plain jam, I kicked it up with some lime juice, lime zest, and cayenne pepper. It's darn good. Grounded by the warm flavor of honey, the jam starts off sweet and tart, the freshness of berries and the brightness of lime shining through, then finishes with a subtle heat that slowly warms your mouth from back to front. I saved a little bit to chill in the fridge and eat later, and as soon as it set (which it did very well, thank you very much), I ate it plain with a spoon. Yum. Make it as spicy as you wish by simply adjusting the amount of cayenne pepper - the quantity needed will vary greatly depending on the heat of your cayenne, the freshness of the spice, and your personal tolerance to heat. Spicy jam may seem less versatile than standard sweet jam, but I disagree. Add a blob to homemade salad dressings and marinades for a sweet and spicy twist. What about using some as a glaze for roasted nuts? Dress up cashew or almond cheese (or chevre or cream cheese if you can eat dairy) by spreading a bit of jam over the top of a round of cheese, and serving with crackers or flatbreads. Try it as a glaze on chicken, pork, salmon, or tofu. Get creative, people - the only limits are your imagination. Happy jamming! And stay tuned - I will be posting a recipe for Honey-Sweetened Plum & Blueberry Jam soon. 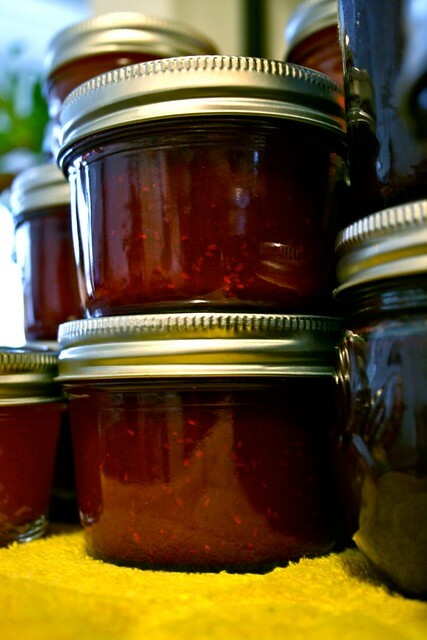 If you want to make plain raspberry jam, omit the cayenne pepper and lime zest. Pamona's Pectin can be found at natural grocers and online. Each package of Pamona's includes the pectin as well as calcium powder to make the calcium water, and a handy recipe chart and instructions. Don't be intimidated - canning really is easy! If you don't want to can, you can just transfer this to jars and keep in the refrigerator for 3 weeks. Wash jars, tops, and rings well with hot soapy water, rinse, and place in pots of hot (not boiling) water. I usually fill the pots with enough water to cover the jars by one inch, remove the jars, bring it to a boil, then shut off the burner. Then put the clean, empty jars, covers, and rings in the hot water and let them sit until I'm ready to fill them. Prepare the calcium water per the instructions in the Pamona's box, and set aside. Place raspberries in a blender or food processor with lemon juice and blend until totally smooth, working in batches as necessary, until you reach 4 cups of pureed fruit. Add lime juice and calcium water, then mix briefly to combine, then add lime zest and pulse a few times. In a small bowl or measuring cup stir together honey and pectin until smooth, and set aside briefly. Transfer pureed fruit mixture to a sauce pan and heat until boiling, stirring often. Then add honey-pectin mixture and stir constantly for 1-2 minutes to dissolve pectin, adding cayenne pepper while stirring to your tastes (start with less and add more gradually). Return mixture to a boil and then remove from heat. Remove jars from hot water and set on a double thickness of towel or cloth. Fill jars 1/4 inch from the top with jam mixture. Wipe rims clean. Screw on two-piece cover. Place jars in pots of boiling water (water should cover jars by 1 inch), cover pot, and process for 10 minutes, working in batches as the size of your pot allows. After 10 minutes, remove jars from pot and set on a double thickness of towel, away from drafts. Allow to rest for 24 hours before checking seal on jars, then label. Store with or without ring. Will keep for 1 year at room temperature, and lasts for about 3 weeks in the refrigerator after opening.